This combo is basically heaven to me. Butterscotch and bacon have a caramelly affinity for one another and I love the sweet salty combo. As for the bacon craze: I get it. Add some smokiness to the mix and you’ve got something really special. But I love pigs, they are cute and smart, and so my bacon comes in plant form. 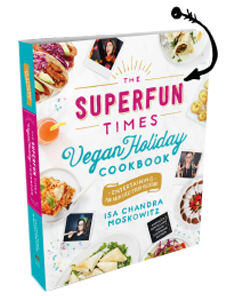 Now, this recipe really elucidates vegan rule #14 “Vegans can and will make bacon out of everything.” Hide your eggplants, protect your carrots and build a safehouse for your coconut because the vegans are coming for their BLTs. And cupcakes. 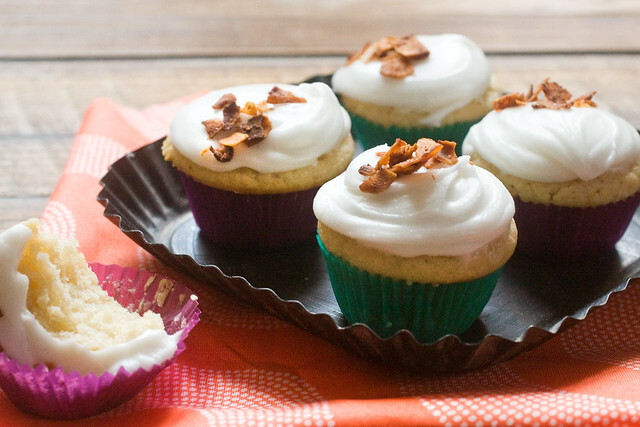 But before you yell at me about how inaccessible this recipe is, let me state: you can make these into plain old (but deliciously amazing exceptionally wonderful) Vanilla Cupcakes With Vanilla Frosting. I, however, had just come into a windfall of Coconut Bacon and I was determined to use it. My boyfriend does this blog, The Laziest Vegans In The World, and he purchased a bunch of Phoney Baloney’s Coconut Bacon. Honestly, I mostly ignore the stuff he eats (unless it’s chocolate, duh), but I was pretty intrigued because, well, see above. I love vegan bacon. And I especially loved the simple ingredients list and, yum, is this stuff ever smoky and good! Because it’s made from coconut, it just seemed right to put it in a sweet treat. You can order Coconut Bacon or make it yourself. The second exciting part of this post is about the coconut-based frosting and cupcake. Not to get too heavy-handed in a post about cupcakes, but I also love orangutans. Just today I saw a heartbreaking article about what palm oil production is doing to orangutan habitats. Although there are claims of sustainability from some companies, there is too much conflicting information about it. And so, awhile ago I decided not to use palm oil in my recipes. Which, unfortunately, means I won’t be using any vegan butters (for now.) So this recipe uses an applesauce-coconut oil concoction that I find works perfectly for buttery baked goods. Now that I’ve made this recipe totally depressing, let me brighten it up! As I mentioned, these make perfect vanilla cupcakes as well. The cupcake is already vanilla, so we’re good there, and for the frosting, simply replace the extract with pure vanilla. Since vanilla is much less powerful than butterscotch, use a bit more. Say 1 1/2 teaspoons. And dress ‘em up with some cute naturally colored sprinkles or whatever else makes you forget about all of the misery in the world. OK, now go forth and be sweet and salty! ~ I don’t want to scare you off, working with coconut oil isn’t difficult, but you do need to pay attention to a few things. You can not do a one for one swap, or your baked goods will come out greasy because coconut oil pretty much pure fat, whereas margarine has some water and other ingredients in there. I really like to use a little unsweetened apple sauce in combination with the coconut oil. For 1/2 cup of margarine use about 1/3 cup coconut oil and 2 tablespoons applesauce, as I’ve done here. ~ For the frosting, you have to work warm. Otherwise the coconut oil coagulates and just doesn’t act how you want it too. So follow the directions, paying attention to the temperature of both the melted coconut oil and the warm milk. ~ Use refined coconut oil, because otherwise the coconut flavor will be very pronounced. Just be sure that the jar says “expeller pressed” so that you know it’s not overly processed or hydrogenated. ~ If you can’t find vegan butterscotch extract, you can order it online. I think it’s worth it to have around, since it’s such an easy and affordable way to elevate your baked goods with a special flavor. One bottle will last you a lifetime. ~ Lastly, I made these cupcakes into minis. But I am giving directions for full-sized. If you want to make them into minis, bake for 16 minutes, and be advised that they make about 3 dozen minis. Preheat oven to 350 F. Line a cupcake pan with paper liners and spray lightly with cooking spray oil. In a measuring cup, mix together the almond milk and apple cider vinegar, and set aside to curdle. In a large mixing bowl, use an electric hand mixer on medium speed to beat the coconut oil, apple sauce and sugars, until it appears caramelly. Now add 1/2 cup of the flour, the baking powder and salt, and beat again. Add half of the milk and another 1/2 cup of the flour and beat until smooth. Staggering the milk/flour helps to achieve a smooth and even batter. Add the remaining milk and flour and beat just until smooth. Fill cupcake liners most of the way. Bake cupcakes for 20 to 22 minutes, until a butter knife inserted through the center comes out clean. Let cool completely, and in the meantime, prepare the frosting. In a large mixing bowl, using an electric hand mixer, whip the sugar and a pinch of salt with 2 tablespoons of warm milk and half of the melted coconut oil, until well combined. It should be thick but pliable and almost smooth. Add the remaining coconut oil and, if necessary, the remaining tablespoon of warm milk, along with the butterscotch extract. Beat until totally smooth and ribbony. Refrigerate for about an hour, and whip again. It should be ready to use now! If it’s too thick, add a tablespoon or so of warm milk, until you get the right consistency. Use a large tablespoon to scoop on a good sized amount of frosting. Smooth is out with the back of the spoon, then sprinkle on a scant tablespoon or so of coconut bacon. Serve! The cupcakes look delicious, but I hate vegan bacon. I met a dog that ate a door handle one time, but wouldn’t eat the vegan bacon I had tested out! Where do I get or how do I make coconut bacon? Um. Really? Read the post, dude. Really excited to try the frosting recipe. I, too, have been depressed about palm oil but haven’t had much luck using coconut oil in its place, often getting a gritty consistency. Your method sounds promising. It’s so cool that we’re now operating in a space where omnivores have had an exclusive backstage pass for a while. Ultimately, meat/bacon/whatever is not magic, it’s just a mix of textures/flavours/aromas/properties, etc. Cool idea – thanks for putting it together. I look forward to trying it. thank you for giving us palm oil free tips!!! Thank you for mentioning the problem with palm oil! It’s pretty difficult figuring out which sources are ethical…thank you for using an alternative. I usually (like, every day) make tempeh bacon so I’m interested to see how the coconut bacon turns out! Wait, wait. There is such a thing as butterscotch extract?! How have I missed that all these years? This is a glaring oversight! I’ll skip the “bacon” (I’m just not an analogue fan) but the cupcakes are going on my birthday menu. Wow love between the cook from scratch and lazy camps! Bring on the butterscotch! Bring on the bacon! Bring on the goodness! That article is torturous to read- so so sad. I can’t believe I’ve been pretty much ignoring this issue. I definitely can’t anymore- so long vegan butter, bring on the coconut oil! These cupcakes look amazing Isa, thanks for sharing them and all your useful tips as usual. Yep, looks great! Unfortunately, making your own butter is a bit out of the average homecook’s lifestyle. Can you share what brand of butterscotch extract you used? According to amazon, Frontier, which is the only one I can find at WFM, contains natural flavors from milk derivatives. Blerg! Please ignore my previous comment, I didn’t see that you linked to one 🙂 Thanks!! You always have a way of refocusing my intentions. Just this weekend, after I made way too many cupcakes and went through a whole box of EB sticks I thought, there has to be a healthier solution! While I know they claim to buy sustainable palm oil, I don’t know if I buy it. I will try this coconut oil mix and continue to look for more palm-free substitutes- keep them coming! Having “family dinner night” tonight…needed a dessert and voila…like magic the girl comes through. Must be a sign when I have all the ingredients, well…for the vanilla version. My frosting wasn’t playing nice so I tossed it all in the handy dandy processor and…man-o-man it is amazing! So perfectly thick…creamy…frosting heaven I tell ya. I just hope I saved enough for the cupcakes! I decided to stop buying products with palm oil too after reading the VegNews article a couple months back. Goodbye Earth Balance (and lots of processed baked goods!)! I felt like I was being an extreme vegan, so I am glad to hear of others foregoing this product as well. AND I am so glad to have more baking recipes that do not use vegan butter. I have been making a lot of your oil-free dessert recipes from the Forks Over Knives cookbook, and I absolutely LOVE them. I think I missed the point of the cookbook b/c all I make from it is baked goods but oh well! I made the cupcakes plain – so my kids can have dessert, but with less sugar. I don’t use extracts because of the alcohol, so I slit a vanilla bean and steeped it in the almond milk which I warmed up just a bit. Then I scraped the bean insides into the milk. These were so yummy! But the best part about making vegan cupcakes? Licking the bowl without worrying about salmonella! Isa, thank you for bringing up the palm oil controversy in your blog. I gave up palm oil over a year ago after reading too many disturbing articles and coming to the conclusion that sustainable palm oil doesn’t exist, despite many claims to the contrary by Earth Balance and other companies who rely on it for the products they sell. Now it’s time to persuade the many vegan bakeries that use palm oil in their products to find an alternative. Back again to say these little darlings were the hit of the show! Just now smashed down the last survivor. Stop on by if you get a chance because I blogged about them and you! My heart belongs to you for denouncing EB products. Or, rather, products with palm oil in it (which happen to be EB products). I recently came across a disturbing tidbit about EB (via the Vegetarian Site’s blog) which has turned me off of their products indefinitely. (They’re the same company as Smart Balance, which uses factory-farmed eggs. 🙁 ) Coconut oil in baked goods ROCKS, anyway. Isa, I just wanted to thank you for always posting inspiring recipes that encourage me to try to expand my culinary horizons. I absolutely love your cookbooks, too. Veganomicon had just come out when I made the change and I kind of think of you and Terry as my vegan fairy godmothers that helped a midwestern, meat and potatoes loving girl get comfortable in her new lifestyle. Can’t wait to see what you come up with next! This is exciting! Thanks for the palm free frosting! How does it pipe? Does it hold up nicely after being piped through shaped tips, or go flat? I never got the bacon-in-everything trend, but Isa, if you say it’s good, I will have to try it. I’m a salt-and-smokiness-aholic so I am sure I’ll love these. A place here in Philly called the Memphis Taproom has been serving a sandwich with coconut bacon forever. Today I made these cupcakes sans frosting as my daughter prefers them this way. She waxed poetic about the fluffy texture of the cake and deemed them better than “regular” cupcakes. She is a vegetarian who is really a vegan in training. We’ve had a talk about rennet and the problems with palm oil. When she has access to yummy foods like these cupcakes, transition to a vegan diet becomes a no-brainer for her. I’m happy to do the cooking. Thanks so much for providing me with the recipes and the talking points. Vegan Butterscotch Frosting. Bacon Coconut. Sweet + Salty. Pure Heaven. The frosting recipe worked out perfectly, but I had a really hard time finding butterscotch extract, and the one I found turned my frosting bright yellow! It looked… interesting… with the chocolate cake. I’ll order something else online next time, for sure. Hand made the coconut bacon and Oh. My. God. So worth it, and I don’t like meat substitutes. I’d recommend adding a little salt to the recipe, but the texture was freaking amazing. Plus, the recipe made so much, I’ll be eating it on salads and sandwiches all week! Thank you for, once again, making me a better baker! Wow, sounds interesting with the chocolate! Have you ever tried making vegan butter? This recipe is REALLY good and palm oil free. Seriously. It tastes way better than Earth Balance (the only non-hydro vegan butter near me) and has a texture more like ‘real’ butter. I would recommend using liquid soy lechitin (or sunflower lecht, and coconut milk if you wanted to make it soy free) I’ve tried making it with the granules and they just clump up, even with an immersion blender. Also, freezing it in small containers really does help the texture, I’ve tried freezing it in an Earth Balance container and while the taste and melting ability are still great it gets a bit grainy on the tounge… anyway I hope you try the recipe bc it’s really great! And doesn’t have the wierd chemically taste of EB! My cupcakes never turn out the way I want them too because of what I think is the coconut oil. It makes them more muffin like and has an odd taste to it. What am I doing wrong? Do you have any advice for turning this into a cake? Hi Isa, Are the Natural Flavors in the Silver Estates extracts non-milk derived? I clicked through their FAQ’s and didn’t see any comment on that. I assume that you confirmed with them. Thank you! That is brilliant! I can’t wait to try this coconut bacon. I have all of the components ready for these for my husband’s birthday dessert tonight. I’m thinking I should wait to assemble them just before it’s time to eat. I am nervous about the coconut bacon losing it’s crispness in the fridge and I imagine the frosting should stay cool. Any recommendations on making them ahead of time or do you advise against it? Separately everything tastes incredible, I can’t wait to try these! Thanks for speaking up about palm oil in vegan margarine etc. This has been a long struggle and boycott. These are heavenly, and I am s-l-o-w-l-y winning over my work peeps to “vegan” everything, and shoving these in their face just about made them turn the corner. Almost! Making a second batch (only 2 days after the first batch) to present to another crowd. The “bacon” is the kicker, perfect saltiness to the sweet. Thank you! It looks so delicious! I just need some butterscotch and than I stark baking those! Thak you for your great recipies! As i was expected to be awesome!